Of course it's raining, Rick. You're in a cyberpunk setting. Ever noticed how the weather is always lousy in Cyberpunk settings? When it's not pouring down, the sky is overcast with dark, pollution-laden clouds that barely let any sunlight through. Often overlaps with Industrial Ghetto. Compare City Noir, Partly Cloudy with a Chance of Death. Ghost in the Shell and Innocence, though the weather is nicer in Stand Alone Complex. An nime version of Dominion Tank Police is set in a future where the weather is so bad even ordinary people carry gas masks with them for fear of pollution. There's always some clouds or weird shadows in Serial Experiments Lain. In Ergo Proxy, the world is always cloudy. It's a plot point because the Proxies were designed to die in the presence of sunlight. Silent Moebius, which was heavily influenced by Blade Runner, is set in a Tokyo with near constant rain. In Kiba, there's one place populated entirely by cyborgs where it's always raining. In Elephantmen, it rains very frequently in 2250's Los Angeles. British-born creator Richard Starkings says this is becaus "all Englishmen in L.A. miss the rain -- or at least I do." 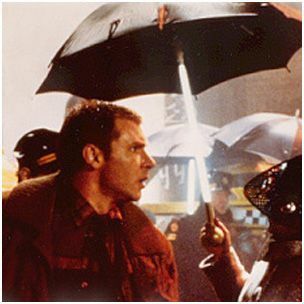 Blade Runner is probably responsible for starting the trend in films. The endless rain was a reference to Film Noir. It also helped disguise the fact that he was just shooting on the backlot—all those scenes set at night with lots of rain and smoke are a great disguise. In The Matrix, the weather is initially always nice inside the matrix, but outside the Matrix, the sun is permanently blocked by a planet-covering cloud of nanites. Once Smith takes over the trope applies directly to the world inside the Matrix. Spielberg's Minority Report features some sunny vistas, but there's also quite a few overcast skies, as well as precog-predicted rain. Immortel Ad Vitam is a French cyberpunk film taking place in New York. The skies are perpetually and dismally overcast, except in Central Park, which mysteriously has the weather conditions of Antarctica. One doesn't see any sunshine in Avalon (film), but that might be a side-effect of making everything Deliberately Monochrome. It's always dark in Dark City. Again, justified by the eponymous city being controlled by aliens who can't stand strong light. Alan Rudolph's Trouble In Mind is a noirish tale set in an indeterminate retro-future filmed in Seattle, appropriately named "Rain City" here. Cyberspace in Tron: Legacy is clouded over pretty much all the time, although it never actually rains. Although there is the one scene when Gem meets Sam in the street and she is wearing a raincoat and carrying an umbrella. The Earth in James Cameron's Avatar is seen to look like this in new scenes added at the beginning of the Collector's Edition Extended Cut. Parodied and subverted in Back to The Future Part 2. The DeLorean lands in a back alley, gearing up for a dark, cyberpunk setting...and then the skies clear. Neuromancer by William Gibson. The original line was meant to invoke the gray static seen when an analog channel goes off air. Unfortunately, in modern digital broadcast systems, a dead channel shows up as solid bright blue. Ironically, the opening phrase still works, provided one interprets it as proof that urban techno-fetishist Case is so thoroughly-alienated from nature that the only thing he can think of to compare a gorgeous blue sky to is a damn television screen. Lampshaded by Neil Gaiman in Good Omens, by using the same phrase to describe a clear sky. Ray Bradbury's All Summer in a Day is a Raygun Gothic example. It is set on Venus. It rains all the time, except for an hour every seven years. One of the schoolchildren in the story lived on another planet for a bit before her parents moved to Venus, and her constant tales of the sun there annoy everyone else, who are either jealous or think she's a liar. She is locked in a closet during the precious hour of the sun coming out. The Long Rain of Ray Bradbury. Ursula K. LeGuin's The Lathe Of Heaven is set in Portland, Oregon, whose normally cool, rainy Northwestern climate has become warm and rainy, thanks to Hollywood Global Warming. In a 1971 book, for the record; we've seen this coming for a long time. Bruce Sterling's Heavy Weather (1994) turns this trope Up to Eleven, as climate change has increased the violence and unpredictability of global weather patterns to such an extent that "Tornado Alley" in the Great Plains has been rendered nearly uninhabitable. In the miniseries Cold Lazarus it was thick smog. Like, closer to brown smoke. People wondered aloud what it must have been like when the air was clear enough to go for walks outside. The original default campaign setting for Shadowrun was Seattle. Not only was it cloudier and rainier than most of the U.S., but the weather often included acid rain. Same for Cyberpunk 2020, where the weather often includes acid rain. Or worse. On the Planet/City of Mort in SLA Industries, it rains for approximately 364 days per year. Which is perhaps fortunate, given that even Mister Slayer himself doesn't want to see what happens to the when it stops raining and all of the serial killers, hired mercenaries, gun-wielding gangsters, drug-fuelled war veterans, crazed mutants and even his own Operatives get hot and bothered. The first arc of Binary Domain takes place at night, during heavy rain. It is always night in Deus Ex. Or sunset. This is a game mechanics thing -- Deus Ex's sneaking system requires shadows. It fits perfectly into the game's theme. In Deus Ex Human Revolution, it's almost always night, overcast or raining. There's plenty of light in Jensen's apartment, though, so it can stream through the windows just like in [dead link] Blade Runner. In Hengsha, it's actually a perfectly sunny day, but the Upper City high above and the tall buildings block most of the light. The weather in Detroit isn't rainy but there is the occasional thunder and lightning. The Metroid series loves its acid rain, featuring the stuff on two different incarnations of Zebes as well as the Space Pirates' home planet (where it'll kill you in seconds unless you've obtained a hazard shield). Planetarian features a continuous downpour of acid rain. It's always night in Snatcher—which is a big homage-off of Blade Runner. Granted, it's because the titular Snatcher's fake skin suffers horribly in direct sunlight. Final Fantasy VII: It doesn't rain in Midgar because of the plate over the lower city(ies), but it is dark, gloomy, and polluted, to the point where even the ground and sky turn black around the city on the world map. There's a peripheral reference to this trope in a level of the original Unreal Tournament. Outside the windows of the fight compound there is constant rain, and the map description mentions the suicide-inducingly dreary weather as the reason this scientific outpost was converted into a deathmatch arena. Played with in Dystopia. No official maps take place on sunny days. They're all either at night or on overcast days, but this is used uniquely in the tutorial. As you're exploring the abandoned underground complex, your supervisor notes that the artificial day/night cycle is stuck at sunset permanently. One of the urban missions of the original Perfect Dark game (which is set Twenty Minutes Into the Future) is on the streets of Chicago, where it's raining. This is a feature of the Junkyard in Digital Devil Saga. Unlike most examples however, it's actually part of the plot. In Gemini Rue, it's always raining on the planet Barracus. This might have something to do with atmospheric conditioning to keep the air breathable for humans. Parodied in Ratchet and Clank Up Your Arsenal, where a button on the Studio World triggers rain on a cyberpunk city set. Mario Kart 7 has a cyberpunk track "Neo-Bowser City", where it's always raining. The Chicago level in Perfect Dark is essentially an homage to Blade Runner, complete with heavy, constant rain. In the science fiction visual novel Bionic Heart, it is always dark, cloudy or rainy. The horrible weather is explained by global warming destroying Earth's climate and turning it into a Single Biome Planet. In A Miracle of Science, Venus is depicted this way. Word of God confirmed  this as a Shout-Out to Ray Bradbury and others who depicted Venus in this manner. The reason for this common early picture of Venus showed that is full of clouds that make it impossible to see the ground. These were long assumed to be rainclouds, and thus Venus was depicted as a steaming rainforest, by Bradbury and others such as Howard's John Carter of Mars series. Paradise City in Sluggy Freelance. Riff getting a clear view of the sky becomes a plot point. Seattle, home to many tech companies (prominently giants Amazon, Nintendo of America, and Microsoft, but also many smaller companies), is known for its gray weather. Shanghai, the Mega City par excellence of China (see here, gets almost twice as much rain yearly as London does, despite England having a reputation for dismal weather. Some U.K cities, with their highest concentration of surveillance/security cameras in the world can be though of having some cyberpunk elements. And the U.K has a reputation for overcast, wet weather. ↑ Keep in mind that this refers to the static of older analogue televisions, not the bright blue of digital ones. This page was last edited on 15 September 2018, at 09:05.